At Grace we strive to worship and praise God with all the skills, enthusiasm, creativity, excellence and love we have! We offer three different worship services every week. This intimate, informal service is offered year-round for those who are either not able to worship on Sunday or prefer to worship mid-week. The texts and sermon for the day are the same as the ones that will be used on the following Sunday. The service is scheduled to last approximately 45 minutes. 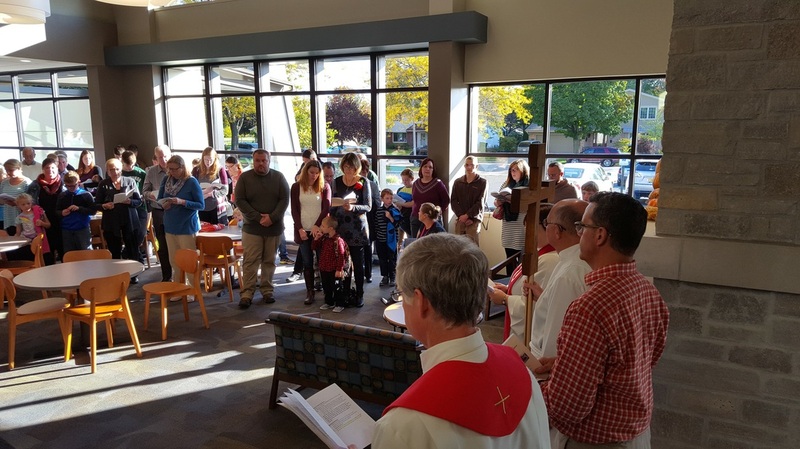 Spoken liturgies are frequently used and Holy Communion is offered every week. This service uses a traditional style of worship. We mainly use the services from the Evangelical Lutheran Worship Book. The service is scheduled to last approximately one hour. Holy Communion is offered the first, third and fifth Sundays of the month and every week during Advent and Lent. Special children's messages and the Jubilation choir are a part of worship on the second and fourth Sundays of the month. The entire service is projected onto the screen, but there are bulletins available for those who need them. This service is called the "Celebration Service" and is lead by our Praise Team under the direction of Vince Olson. Using keyboard, guitars, drums and sometimes even a ukulele this service offers upbeat contemporary Christian music. Volunteers lead the singing and the entire service is projected onto the screen, but there are bulletins available for those who need them. The service is scheduled to last approximately one hour. Holy Communion is offered the first, third and fifth Sundays of the month and every week during Advent and Lent. Special children's messages are offered on the second and fourth Sundays of the month. During the summer months we have the Thursday evening worship at 6:30 p.m. Memorial Weekend-Labor Day we have one service at 9 a.m., with the exception of the outdoor service at 10 a.m. on the last Sunday in June. We offer a variety of worship formats during the summer including a special celebration for our graduates at the end of May, our annual outdoors service in late June and a special service in mid-August led by the children in our Vacation Bible School. Holy Communion is offered at every service in the summer.